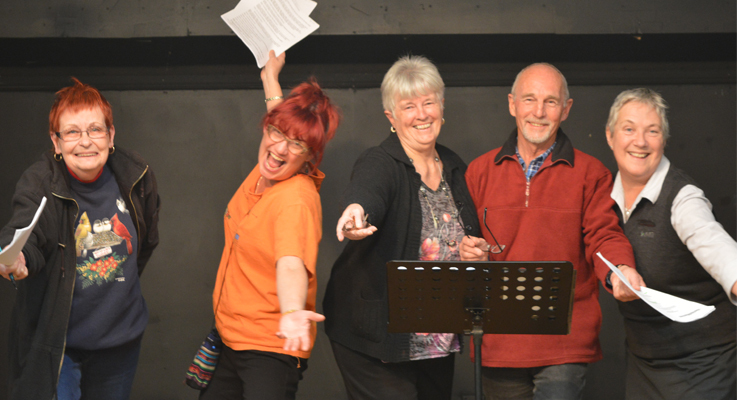 Myall Coast Entertainers have begun rehearsals for two great comedy plays to be presented on the 14-17 October at Hawks Nest Community Hall, and a matinee at North Arm Cove Hall on the 17 October. One play which is titled, ‘The Misused Mill Girl’, features Sir Simon a self confessed louse who is cranky because his son Lancelot has married a cheap Mill Girl. Being ‘the villain’ he plans to get rid of his new daughter in law, with devious plots becoming the order of the day, with heart wrenching results. President Allan Wilson believes the audience will go “ballistic” at Sir Simon’s devious deeds, and invites the audience to boo him. The other play to be presented, is called ‘He Said She Said’, which involves Mrs. Packard a dinner party guest who is a bit of a gossip. Allan said this ‘simple’ question then leads to a fun packed evening of, “he said, she said” (gossip), with a surprise ending. Tickets will be on sale from 7 September at Hawks Nest and Tea Gardens Pharmacies as well as the Ice Cream Shack at Tea Gardens. Contact Allan Wilson on 4997 1352 for more information.